To help replenish wild populations of corals, whether in areas where there has been a vessel grounding or areas where coral populations have declined due to major environmental events such as coral bleaching and winter cold water events, Florida Keys National Marine Sanctuary-permitted researchers grow corals in underwater nurseries. Sometimes these nursery corals originate as small colonies rescued from seawall and nearshore construction projects. 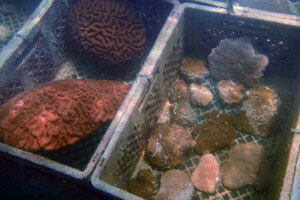 Other times they may have been small corals salvaged from a vessel grounding. These rescued corals are given a second chance when they are moved to an underwater nursery. In the nursery, they may be attached to pedestals on blocks on the seafloor, hung on line nurseries that look like clothes lines, or placed in baskets suspended off the seafloor. The rescued corals are cared for by biologists and volunteers who monitor their health and growth and keep algae, encrusting sponges, and tunicates at bay. The goal of biologists is to transplant nursery-reared corals back out on the reef to bolster existing coral colonies, to re-seed reefs after major events, and to increase the likelihood of a diversity of coral colonies being near enough to each other for successful cross-fertilization during sexual reproduction. 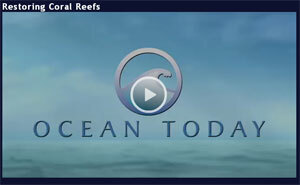 In 2009, transplanted corals were documented spawning for the first time in the sanctuary. Sanctuary partners were awarded $3.3 million through the American Recovery and Reinvestment Act to support efforts in the Florida Keys and Caribbean to improve genetic diversity and increase numbers of threatened corals, while also creating blue-green jobs.